A hobby turns into an opportunity like no other as a Southwest Florida club will help the National Basketball Association build a plane replica for one of its signature events. From sporting a Black Panther mask to emerging from a magician quick-change booth in a retro jersey, the NBA All-Star Slam Dunk competition is known for its wild antics. Contestants need to be creative to win. Frequently, they leap over people or objects to ‘wow’ the crowd. So what does all this have to do with a Radio Club in Charlotte County? “It was kind of like an accidental thing,” said Dennis Fortunato, a member of the Charlotte Radio Control Society. 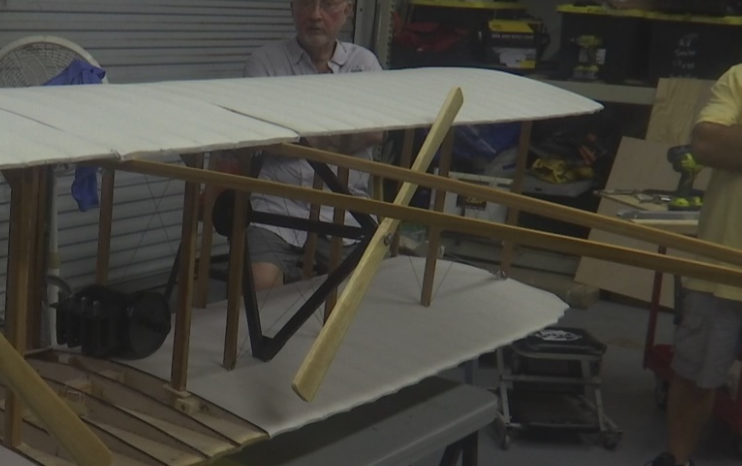 The NBA thought they were calling a group in Charlotte, North Carolina, to order a scale model of the plane used in the Wright Brothers’ first flight. Instead of taking a technical foul, the Charlotte Radio Control Society decided to make the plane anyway. With Saturday approaching fast, the shot clock is ticking. Nine members of the group teamed up for the assist, pulling off a two-month task in one week. The NBA plans to fly the plane from the ceiling of the Spectrum Center in Charlotte, North Carolina, Saturday night. Two players want to jump over it in the slam dunk competition. The Charlotte Radio Control Society said when it is all over, they hope to get the plane back in one piece. The mix-up is turning into a real buzzer-beater for this Southwest Florida club.